[By Fred Lynch in Holderness, New Hampshire] How cold was it in New Hampshire, this weekend? Very, Very. Far too cold to draw outside, as I do. The region was blustered by an "Arctic blast" - bringing below-zero temperatures (Fahrenheit) for much of the time. So, taking inspiration from a fellow sketcher of the farther north, Sheri Blaukopf of Montreal, I decided to try to draw from my car. Driving around, it occurred to me, however, that a man sitting alone in his car - in the passenger seat - in front of an interesting house on a lonesome, rural, woodsy road, could stir suspicion from the locals - and could perhaps be asking for trouble. This is a gun-toting region, afterall and in a gun-loving country. So, driving past many interesting possibilities, I stopped by a tiny weathered wooden hovel. 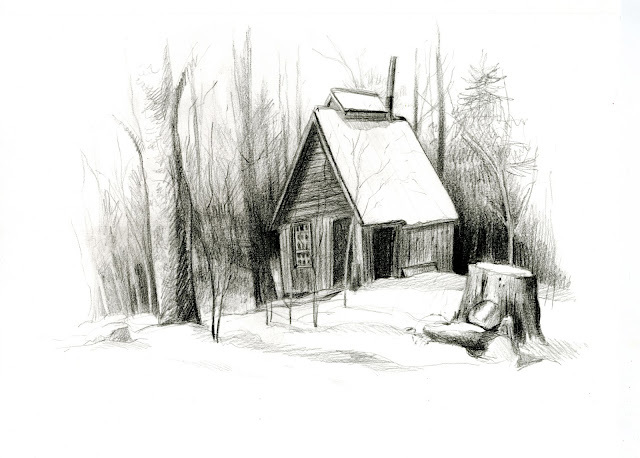 Perhaps it was a sugar shack, awaiting early spring's maple sap, to be boiled down to make tasty amber syrup. Or, maybe it was simply a shed for farm tools. Either way, with its darkened windows, and non-smoking chimney pipe, it looked interesting and empty - cold comfort to me.